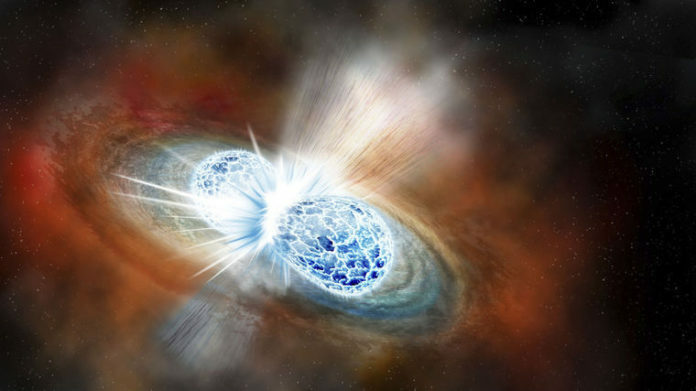 This illustration provided by the Carnegie Institution for Science depicts the collision of two neutron stars detected on Aug. 17, 2017. The explosion threw matter, light, radiation and gravitational waves into space. The discovery was reported on Monday, Oct. 16, 2017. The University of Texas Rio Grande Valley is basking in the glow of another major advance in the science of detecting ancient cosmic cataclysms. On Monday, coinciding with a formal announcement in Washington, UTRGV physics faculty, students and researchers gathered on the Brownsville campus for a news conference to discuss an Aug. 17 detection of gravitational waves created 130 million years ago by the collision of two rapidly spinning neutron stars. LIGO, the Laser Interferometer Gravitational Wave Observatory, made up of two separate facilities in Louisiana and Washington state, detected the waves, backed up by the Europe-based detector Virgo. Gravitational waves, which Einstein theorized a century ago, were observed for the first time on Sept. 14, 2015. UTRGV’s Center for Gravitational Wave Astronomy, formed in 2003, is one of more than a 1,000 international members of the LIGO Scientific Collaboration. The first detection of gravitational waves — in that case caused by the collision of two black holes 1.3 billion years ago — was made possible by an algorithm developed by UTRGV physics faculty, working in collaboration with scientists at the University of Florida. The CGWA also had a hand in the optical aspect of the Aug. 17 detection, via its Transient Optical Robotic Observatory of the South, a collaboration of scientists at UTRGV, Texas A&M and the National University of Cordoba (Argentina). The observatory, which is located in Argentina, serves as a “follow-up” instrument for LIGO and Virgo, searching for visual confirmation in deep space when gravitational waves are detected. TOROS was among the observatories that automatically sprung into action on Aug. 17.